German Prefix Verbs - "ansprechen" | German is easy! Which is not only useful if you want to bring up an issue in a meeting (#businessGerman$$), it’s also what you should do when you’re single find someone interesting and attractive (#datingadvice♥ #absolutealpha). Oh, that. I learned that it’s what you gotta do in 2018 if you want to appeal to a young, cool audience. Pretty cutting edge, right? Sprechen means to speak, that’s pretty much clear. But what about an? Like most prefixes, it has two basic ideas it can add to a verb. The first one is a (broad) sense of “at/on” and the other one is “on” in a sense of being or switching on. That last one is also used in a very vague, abstract notion of starting and that’s what we’re looking at with ansprechen. Because the core idea is that of “starting to speak”. That’s not the translation of course ;). It’s just the abstract core that unites all the uses. But it’s not that bad for ansprechen. Actually, to address is a pretty good match, but it doesn’t work for all contexts. Anyway, let’s just take a look what we can do with the verb. The first use it the sense of bringing a subject or issue into a debate. Or in one word to address. It sounds a tiny bit formal so don’t use it too much with your friends but in a meeting it is perfect. Ich bin froh, dass du das angesprochen hast. I’m glad you addressed that/brought that on the table. But you can not only ansprechen topic, you can also ansprechen someone. If it’s about a particular topic, you’d connect that with auf. In letzter Zeit sprechen mich immer wieder Leute auf meine gute Figur an. Recently, people keep asking me about/mentioning my good shape. But it also works without a particular topic. And one of the most common context is THE context. And by THE context I mean dating. Hmm… I guess my hash tags did attract a younger audience, after all. Du findest ihn süß? Dann sprich ihn an, verdammt noch mal! Es ist 2018. You think he’s cute? Then talk to him/(make a move), damn it!! It’s 2018. Now, ansprechen someone is not limited to dating. 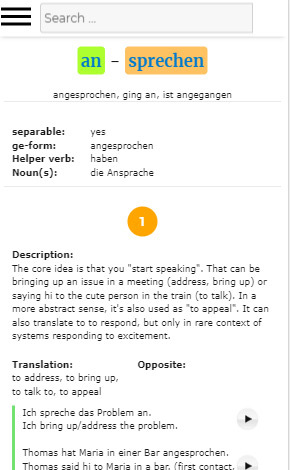 A sales person starting to talk to you in the street would also be ansprechen for example and there’s the really nice adjective ansprechbar, which is about being approachable. Wenn Thomas kocht, ist er nicht ansprechbar. When Thomas is cooking he is not approachable/you can’t talk to him. And actually, it can also be used in a more general sense of appealing to someone. Emanuel versucht mit hash tags junge Leser anzusprechen. Emanuel is trying to appeal to/attract young readers by using hash tags. Das Plakat hat mich angesprochen. The poster appealed to me/I liked the poster. Das Essen war ansprechend angerichtet. The food was presented/ put on the plate in a pleasing/inviting manner. And last and kind of least, ansprechen can also mean to respond. But only in a sense of systems reacting to some sort of excitement. Mein neuer Nonsense-Sensor spricht bereits auf kleinste Änderungen des Machtsinnolin-Gehalts an. My new Nonsense-sensor responds/reacts to even the smallest changes of the Makessenseolin-content. Now, as far as nouns go, there die Ansprache means speech, as in giving a speech. And the difference to die Rede, which also means speech, is that an Ansprache is maybe a bit more “appealing” in a sense of you want something from the audience. And also I feel like an Ansprache is a bit shorter. Mein Mitbewohner hält eine Ansprache über Sauberkeit und Respekt, aber niemand hört zu. My flat mate gives a speech about cleanliness and respect, but no one is listening. But by far the more useful noun is der Anspruch. It’s a bit hard to capture with one word, but the basic idea is that there is a demand, a requirement that needs to be fulfilled. It’s often used in plural contexts where someone has high standards but it’s also used in a sense of demanding and in formal German it is an actual entitlement. It doesn’t really connect to the uses of the verb that we had but if we think of requirements as something that you speak about in the beginning, then it makes at least a little sense. or maybe not, I’m not sure. Anyway, this word is really really useful and definitely worth adding to your active vocabulary. Das Einhorn hat echt hohe Ansprüche, was sein Essen angeht. The unicorn is really picky when it comes to its food. Die Übung war echt anspruchsvoll. The exercise was really demanding/difficult. Auch Minijobber haben gesetzlich Anspruch auf bezahlten Urlaub. Even people who only have a mini-job are by law entitled to paid vacation. A “mini-job” is the official German name for jobs that pay up to 450 Euro per months. And just in case you’re working such a job: yes, you DO have a right to paid vacation. Oh and you’re entitled to sick money as well, by the way. Not much, mind you, but more than nothing. Many employers “don’t know” this, and will tell you that you don’t have the right to it, but you do. So if you feel like I am talking about you right now… let me know in the comments, if you wanna know more. I can hook you up with some links ;). hey and speaking of “feeling talked to”… this brings us right to the last word I want to tell you about… or actually it’s not a word, it’s the phrasing sich angesprochen fühlen which is about exactly that… you feel addressed or spoken about. And it’s pretty common in colloquial German. Immer wenn Thomas “hot” hört, fühlt er sich angesprochen. Whenever Thomas hears “hot” he feels addressed/referred to. Die meisten Menschen versuchen, Deutsch auf die konventionelle Art zu lernen, im Hamsterrad aus Kursen, Büchern, Apps. Aber manche Menschen fühlen tief in sich drin, dass das nicht der richtige Weg sein kann. Fühlen, dass die Sprache schon in ihnen ist; schön, perfekt, natürlich. Und wir müssen sie nur befreien. Fühlst du dich angesprochen? Dann komm in mein Deutsch-Retreat nach Bali. Zusammen meditieren wir, tanzen, lachen, weinen, machen ganz ganz ganz ganz ganz viel Yoga und lassen unser Deutsch frei. Many people try to learn German the conventional way; the rat race of courses, books, Apps. But some people feel deep inside that that can’t be the right way. They feel, that the language is already inside of them; beautiful, perfect, natural. We only have to free it. Do you feel “addressed”/like I’m talking to you? Then come to my German retreat on Bali. Together, we’ll meditate, dance, laugh, cry, breathe, do lots and lots and lots of Yoga and let free our German. Of course you’re now all like “Where can I sign up?” but I gotta seriously up my Yoga before I do that. Seriously, the only time I can touch my toes is when I watch Titanic with them…. the left one always cries. So there won’t be a hippie retreat anytime soon. And that’s it for today :). This was our look at ansprechen, and even though none of the meanings is a must have, you’ll definitely hear it in every day life from now on. As always, if you have any questions or suggestions , just leave me a comment. What… oh… the r-version? Well, there is none ;). This entry was posted in Audio Examples, Broad Vocabulary, German Prefix Verbs, Verbs, Vocabulary. Bookmark the permalink. “reacts to already the smallest changes” strikes me as a dead giveaway of a native German speaker ;-). If I understand what you mean, I might say “reacts to even the smallest changes”. How would you describe the difference between these two sentences? Jemand hat Anspruch auf etwas. Oh damn. I guess I fell into the already-trap again :). Yes, it definitely is a giveaway. “schon” is MUCH broader than already but German native speakers are totally unaware of how out of place it sounds to English speakers sometimes. We had a discussion about that in the comments under “schon” (or somewhere else) but I can’t remember where exactly. Those are really similar, but “Anspruch haben” sounds more formal. I can see “zustehen” being used in non-formal contexts but “Anspruch haben” not really. – Es steht dir nicht zu, so über mich zu reden. You have no right to talk about me that way. This wouldn’t work with “Anspruch haben” because it is obvious that such an entitlement doesn’t exist. Thanks for the article, that was great!!! Your content is always interesting, sometimes a little too “deep” for me ( Ich bin Anfanger) but I find it compelling reading and thank you for the accompanying translations – I am 70-plus and enjoy learning German very much !!! Great to hear that :). Good that you decided to read even though you don’t understand all of it . Just pick the bits that make sense to you and ignore the rest. Uh oh! Do I smell an App in the making! WOW! As for the last example sentence “konventionell Art zu lernen…” I would just like to reiterate that this blog is THE BEST LANGUAGE LEARNING BLOG IN THE HISTORY OF LANGUAGE LEARNING. Meine Pfanne ist in der Küche. Seriously, has ANYONE ever, in the history of Deutschland, EVER uttered that sentence? C’mon, be honest, “Meine Pfanne ist in der Küche”? This is going to be a looooong semester, thank my lucky stars for Emanuel’s blog. Hahaha… to be fair though, I don’t think any German has ever uttered something about a unicorn hunting down deer either. But yeah, from my experience course books are pretty damn boring. With the idea of ansprechen being that something is appealing: this is one of those times when the English translation is hiding in plain sight: when something just strikes you as right, you could say “Well, I wasn’t planning to buy a car today. But this Veyron— it just spoke to me”. I’d add “etwas in Anspruch nehmen” as a good phrase to know, meaning “take advantage of” or “take someone up on” an offer. Ha, that distinction I made between “Rede” and “Ansprache” is purely based on my “feelings”, so they might be the same thing to someone else. At first, I had the directional aspect in mind as well, but I think the notion of “starting” is quite prevalent with “ansprechen”. Continuous talking at someone is not “ansprechen” (“Ansprache” not being considered). That’s why decided to go with that. You can explain “ansprechen” without the directional component, but not without the starting. As for “in Anspruch nehmen”… great addition. I’d just add that it’s not “to take advantage of” in a bad way. I think a lot of times it’ll just be translated to “to take”. – Das nimmt viel Zeit in Anspruch. – That takes a lot of time. Thank you Emmanuel for your lessons! Das ist der erste Beitrag, den ich auf deinem Blog gelesen habe. Ich hatte vor langer Zeit abonniert, aber die E-mails gingen leider in meinen Spam! Ab jetzt werde ich jeden Beitrag gerne lesen! vielen Dank für deine detailierte Erklärung. Es ist vielfach hilfreicher als ein Wörterbuch. Meine Freunde können auch nicht so gut alles erklären. Hey Emanuel, thanks for another great post! One thing I think might be a typo: in the vocab section should it not be “ansprechenD – appealing (nice)”, i.e. the Partizip I rather than the Infinitiv? Absolutely right :). Fixed it. Danke! My flat mates gives a speech about cleanliness and respect, but no one is listening. Oh, that’s a typo :). I meant flatmate. Thanks for the correction. I’m pretty new here but thoroughly enjoyed this entry and will come back for others! Great to hear that :). Viel Spaß!! Ansprechpartner ist auch super üblich, besonders auf berufsbezogenes Deutsch!